The Holy Sacrifice of the Mass is often described as the closest thing to Heaven on Earth. It is the epitome of charity, peace, beauty and joy for the Catholic soul. As we are told by St. Bernard, “One merits more by devoutly assisting at a Holy Mass than by distributing all of his goods to the poor and traveling all over the world on pilgrimage.” To that end, a good missal is a must-have for every Catholic, and I thoroughly recommend the Saint Andrew Daily Missal by Dom Gaspar Lefebvre O.S.B. I’ll start with a description of this missal for those who haven’t had the opportunity to peruse one themselves. 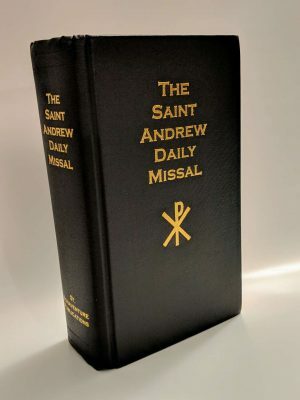 The Saint Andrew Daily Missal is a hefty little hardcover book with nearly 2000 pages and comes with 5 differently colored ribbons for page-marking. The pages are thin, which allows the missal to fit nicely in your hands. It is said to be the most complete traditional Latin-English missal in print, and this fact is indisputable. Each feast day of the Liturgical year is presented with a substantial, explanatory lesson and a classic black-and-white illustration relevant to the Mass of the day. Cycles of the Liturgical year and numerous devotions are also included, along with the Sanctoral cycle, Vespers, the Kyriale (with modern musical notation), the Sacraments, and a host of litanies and other prayers. Latin and English are included side-by-side on the same page for all of the liturgical prayers throughout, including the sections on the Sacraments. This missal is a reprint of the 1945 edition, so there needn’t be any worry about Modernist doctrines. There is much to love about this missal. As is shown by its unparalleled completeness, it was obviously designed to inculcate a thorough understanding of the Mass and the Liturgical year, and to facilitate a fuller participation in the life of Mother Church. The narratives are an excellent preparation for hearing Mass, and the ribbons make marking the necessary pages for following along easy. It is exceedingly simple to follow along through the Mass due in part to the same-page Latin-English format, and also to the brevity of the rubrics. So long as this missal is at hand, one has everything needed to follow along with the administration of the Sacraments as well. Because there is so much packed into these 1,900+ pages, the text is somewhat small, which may be an annoyance for some. However, even with my own poor vision, this missal is easily read. It also lacks a Table of Contents, but has a limited index located near the back, beginning on page 1,965. 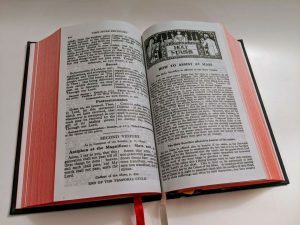 Given the ordered nature of the Liturgical year, the Sanctoral cycle, and the Holy Sacrifice of the Mass, however, the missal is still quite navigable. Unlike other reprints of pre-Vatican II missals, the Table of Movable Feasts (listing the dates each year for: Septuagesima Sunday, Ash Wednesday, Easter Sunday, Ascension Thursday, Pentecost Sunday, Corpus Christi, Sundays after Pentecost and 1st Sunday of Advent) has been updated to cover up to the year 2028. Words cannot express the power or importance of the Mass. It is central to our life on Earth and to the life of our souls. 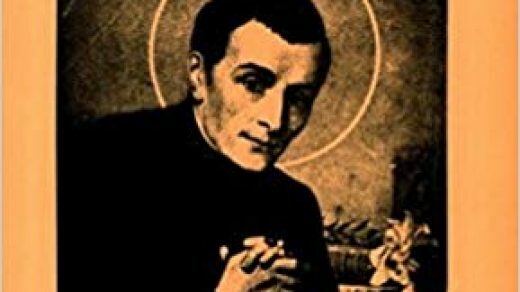 St. John Vianney said, “If we knew the value of the holy Sacrifice of the Mass, or rather if we had faith, we should be much more zealous to assist at it." The Mass, the Sacraments, and the Faith are the focus of a pure and faithful heart. If you’re looking to gain a deeper understanding of, a stronger attachment to, a more fruitful devotion to Holy Mother Church, you will find this missal of great benefit. 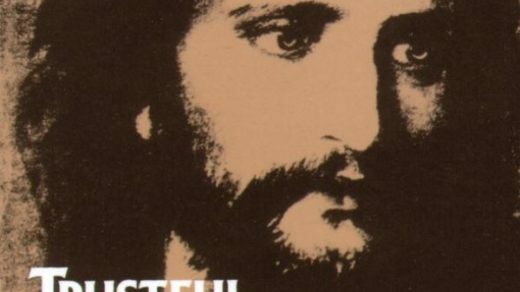 The Saint Andrew Daily Missal is surely worthy of a place in every Catholic home. April is a staff member at True Restoration who helps with the "behind the scenes" details. As an adult convert, she loves learning how to live the Faith alongside her homeschooled children. And also, chocolate and coffee. And chickens. Next story Patrick Henry Omlor: The Robber Church Online Exclusive!